A big thanks to them for being with us. Another great thanks to http://www.boatlessfishing.com and http://www.360tuna.com for letting us host the trip information at their sites. 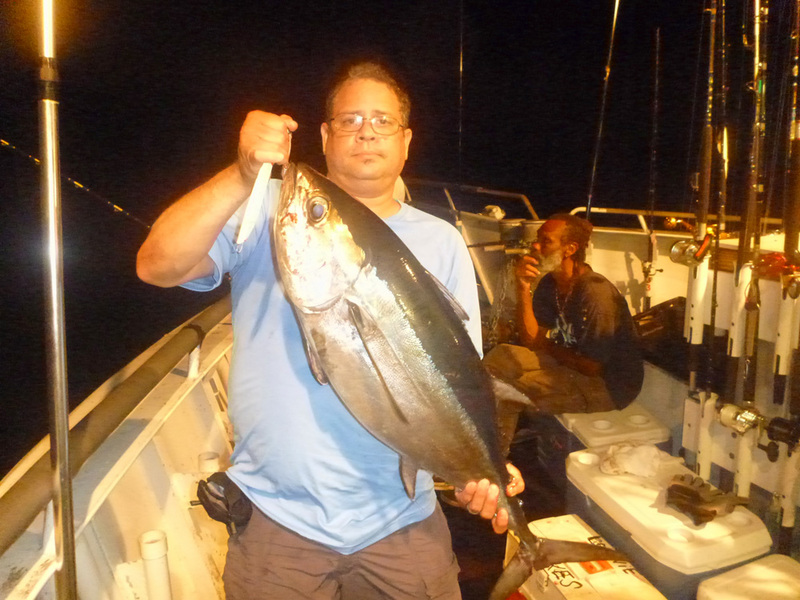 As many people already know that after 59 pages of forum talk and over 25,000 views on the Yankee Capts thread for the 360tuna.com charter the trip was a go but as I docked from another fishing trip I learned that unfortunately the Yankee Capts boat’s generator stopped working. Captain Greg made the calls but was not able to get a replacement on time for the switch for our trip. It was unfortunate that the trip was canceled and had many running around looking for different charters as many were driving from Georgia and the New Jersey area. 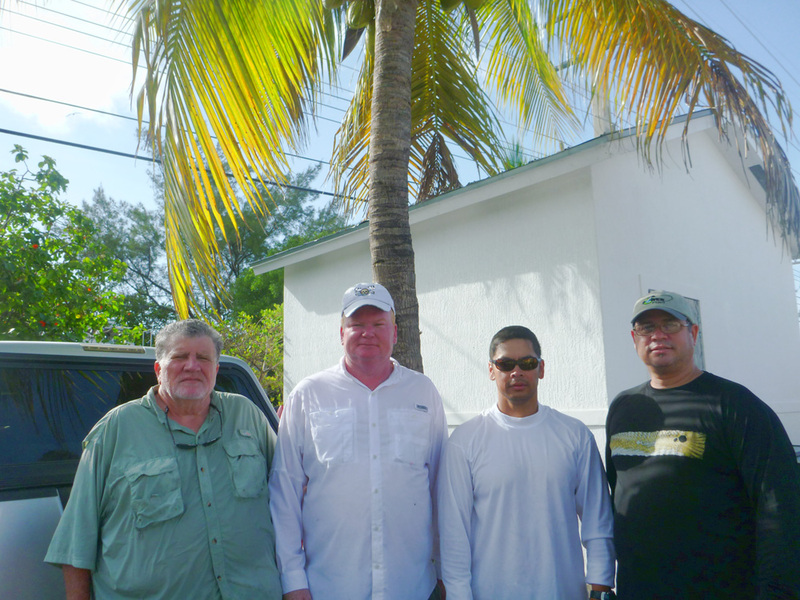 Then the Out Of Control from Fort Myers stepped up and allowed David to make the deposit for an unscheduled Pulley Ridge trip. Thanks to Capt Bill (hawkboat) for the phone calls to set this last minute trip. Where do we start? It was HOT! As Captain Greg said “it’s Africa Hot”. We all had bought water and Gatorade for the trip but it was not necessary as the boat included all you wanted to drink water in the $65 meal plan. I found out too late as I had already loaded it in the boat. Well, I had forgotten that part as I had already been on that ship. Oh Well! We waited for the mates and Captain to load and ready the boat for our trip. We loaded up, we used their carts to get our 50 pound jig bags and rods. I did not take a cooler as they did not allow coolers bigger than 50 quarts in the boat. Afterwards we went to get a bite to eat at the nearby restaurant but we had to take our food to go as they took over an hour to get it ready. It was now almost 9 pm when we left the dock for our 12 hour journey to Pulley Ridge. 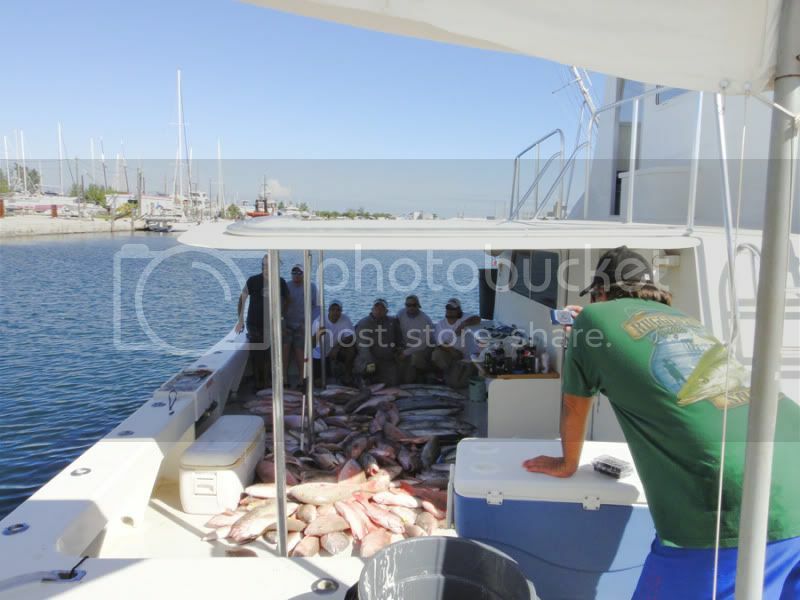 It was about 10 am according to the time in my pictures that we started fishing in the 200 foot marks and were not lucky to find the fish, the Captain kept moving the boat over and over looking for the ones that wanted to bite in the 0 knot current and 0.1 knot wind if that much! That did not help with finding the hungry fish. The boat just wouldn’t move. 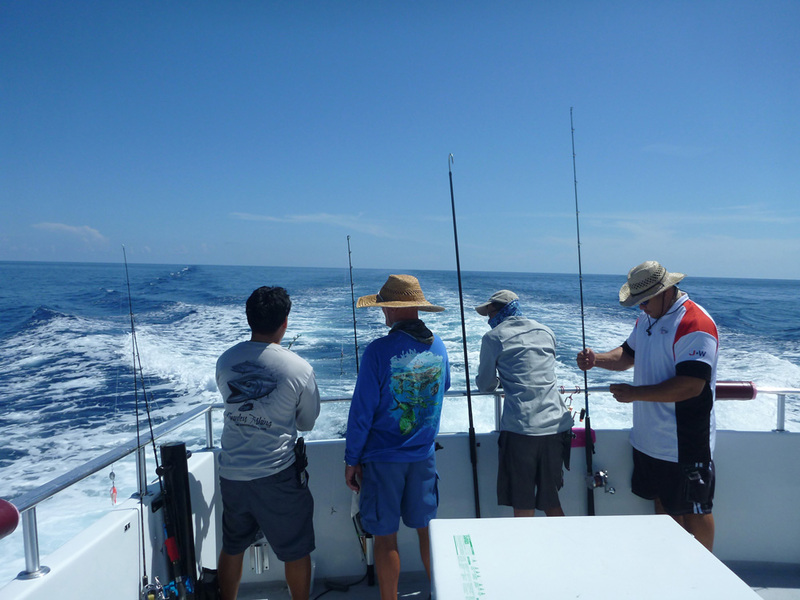 Then the Captain decided to move the boat as we went for deeper and deeper waters plus a Westerly route. In between the moves some people like Q were trolling, they hooked up a few times but the fish came off the hook that many times as well. No fish hit the decks on the troll this day. It was almost noon when the first few fish decided to start chewing in about 300 feet of water. We were jigging pure metal but a couple of people were using electric reels with bait and were the first ones to hook up (David and Q). I hooked my first on the jig and so did Bill, Garriga, and Jay plus many others as the day went through. The day went by and not many fish were landed. We were all worried that we were going to be skunked. 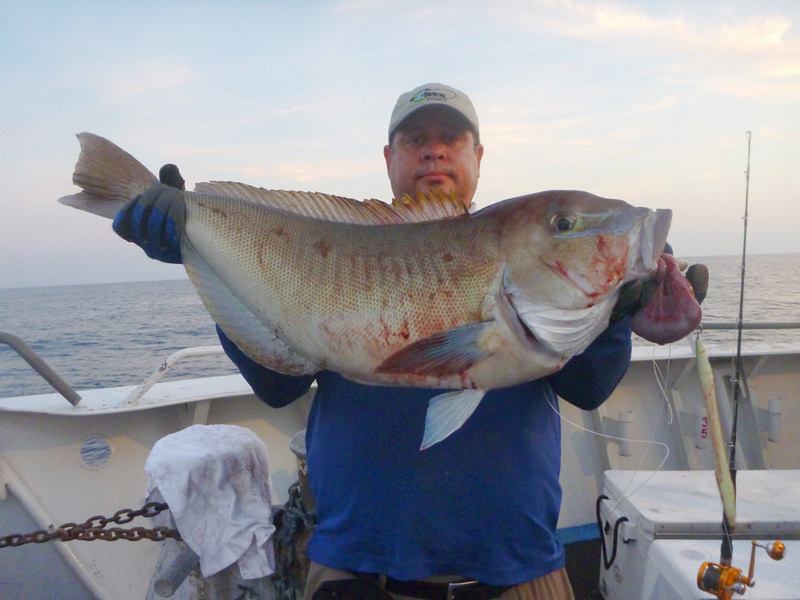 It was not the jigging with pure metal that did it as some had tried with cut baits and live pinfish. Then at around 4 pm things started to sporadically pick up and we started catching some fish again. Below is Q and a nice snowy that barely had spots. He caught this one around 6 pm. This is around the time Garriga gave up on the jigging and then I gave up on the jigs after only catching three snowies on pure metal. Soon after me Jay (redneck_billcollector) gave up on the purist jigging and added bait as well. He outlasted us on the pure metal jigging, even with his foot gout problems. 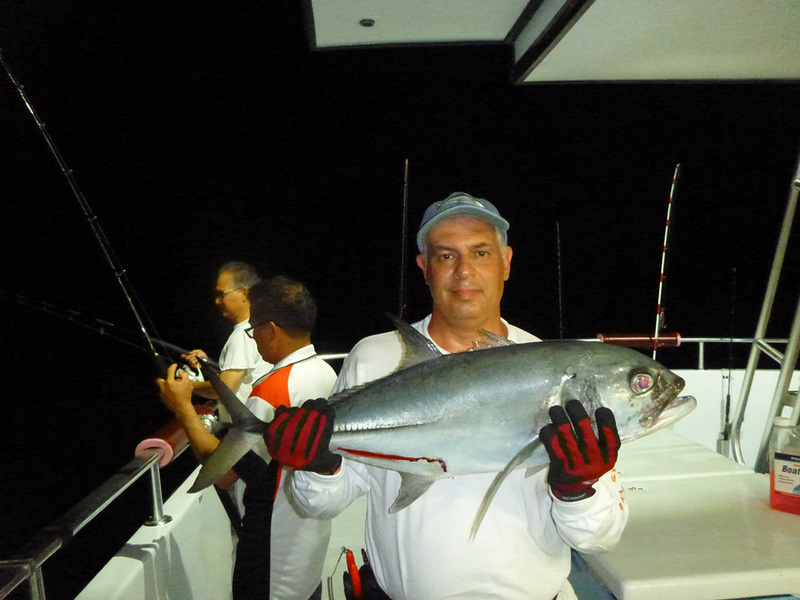 By 11 pm Garriga hooked up with a horse eye jack on a jig. My self, Jay and him kept going back and forth on the jigging and tipping jigs with bait. 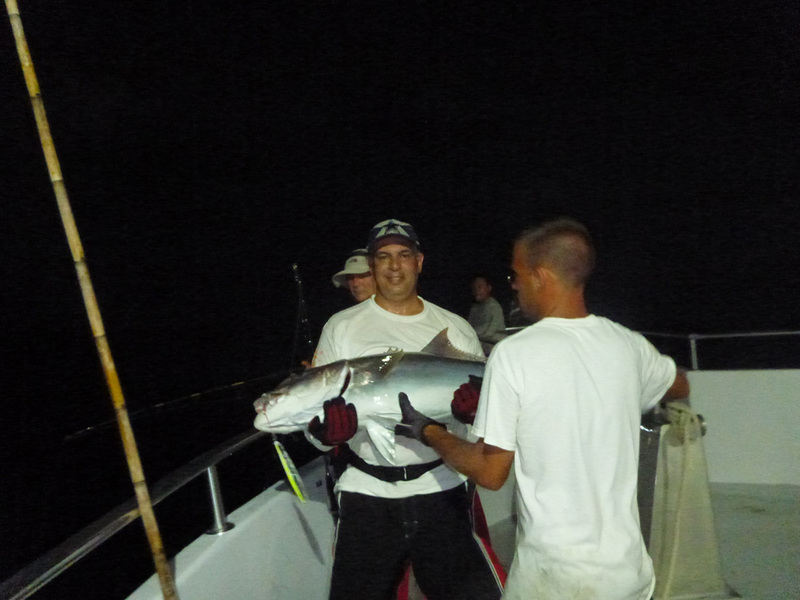 It was past midnight and after one mutton snapper caught we were all waiting for the blackfin tunas to appear. 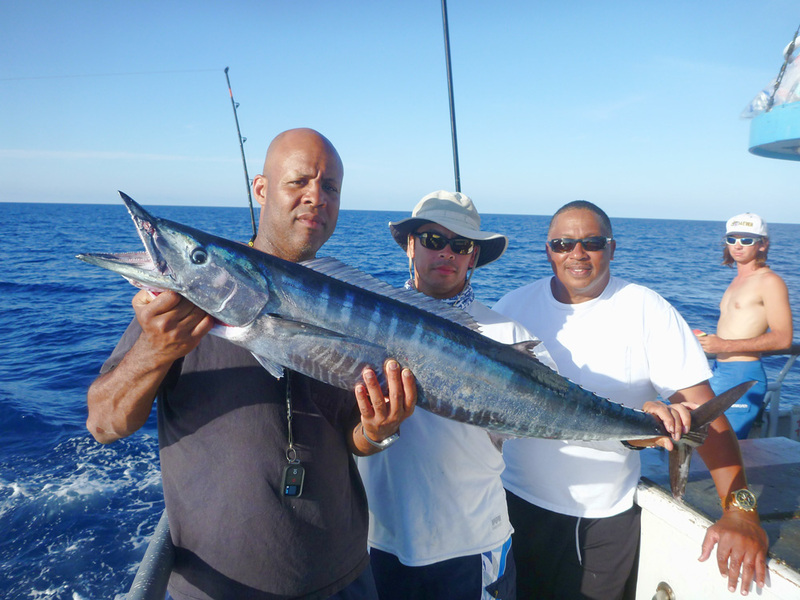 At about two am I took a nap and when I woke up, Jay told me that young Dennis had caught a wahoo on a live flyer. 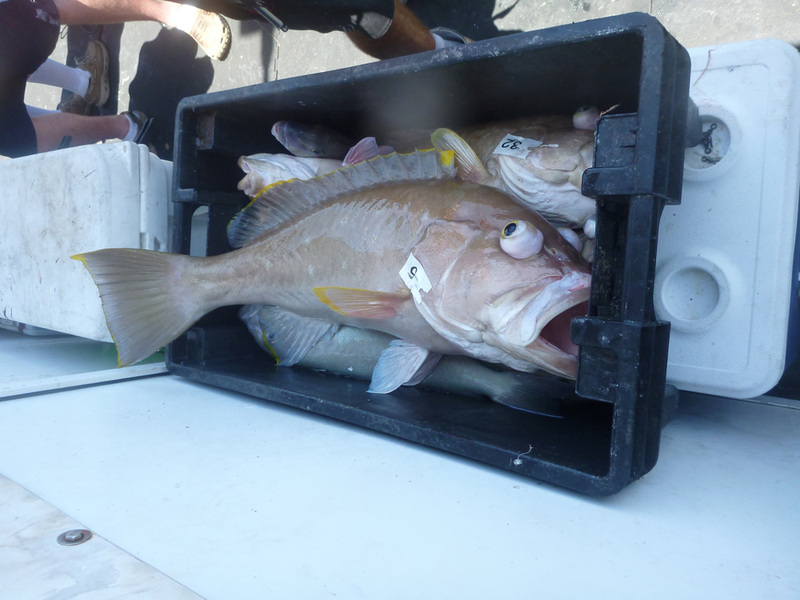 I went to look at the first fish box and found it decently full. 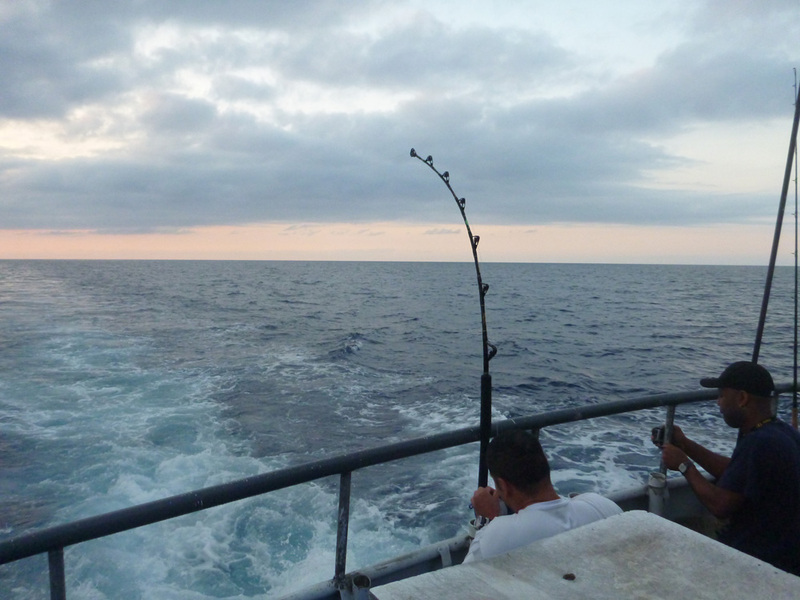 At morning time the Captain took us to deeper water but our luck was going in the same direction as the previous day. Gilbert and I spoke to David and suggested that we should just go to the deep wrecks or the Towers in the Ft. Myers area. David gave it a thought and ran it by the Captain. The decision was made to give it a few tries in deeper waters and then we would move to the wrecks. 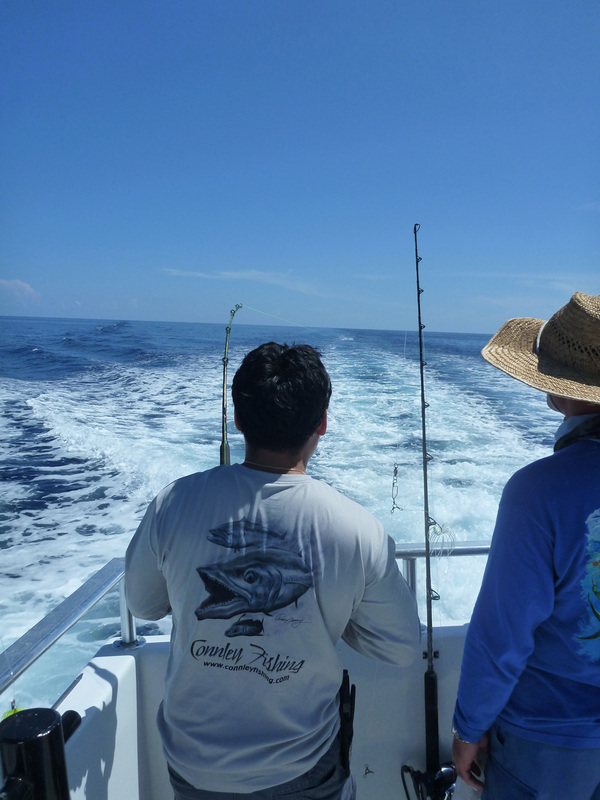 The Captain move the boat to 500 feet and told us that the fish were about 30 feet from the bottom. 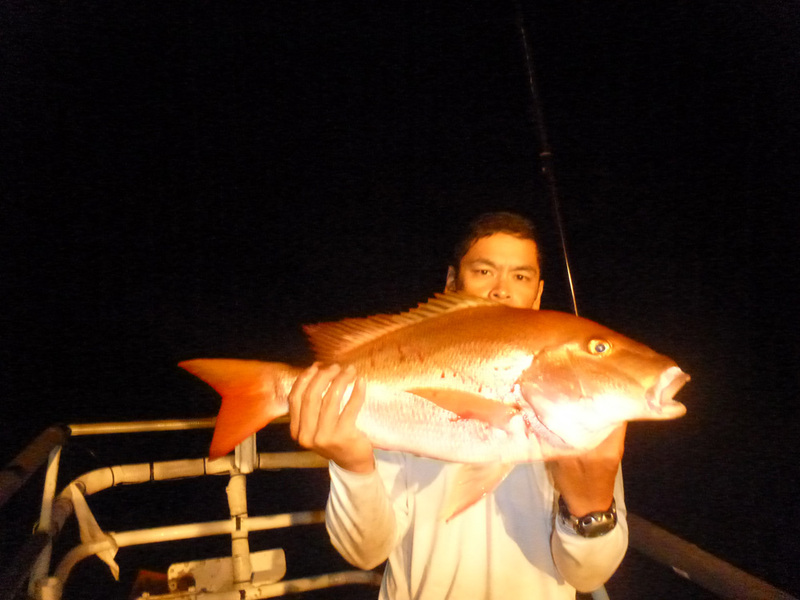 The Captain was good at letting us know at what dept the fish were so we were able to efficiently target them. By this time the current had picked up just a bit to about .4 knots if I remember correctly plus we had a small breeze that made it feel more comfortable. 9:30 am HALELUYA!!! QUEEN SNAPPERS!!! 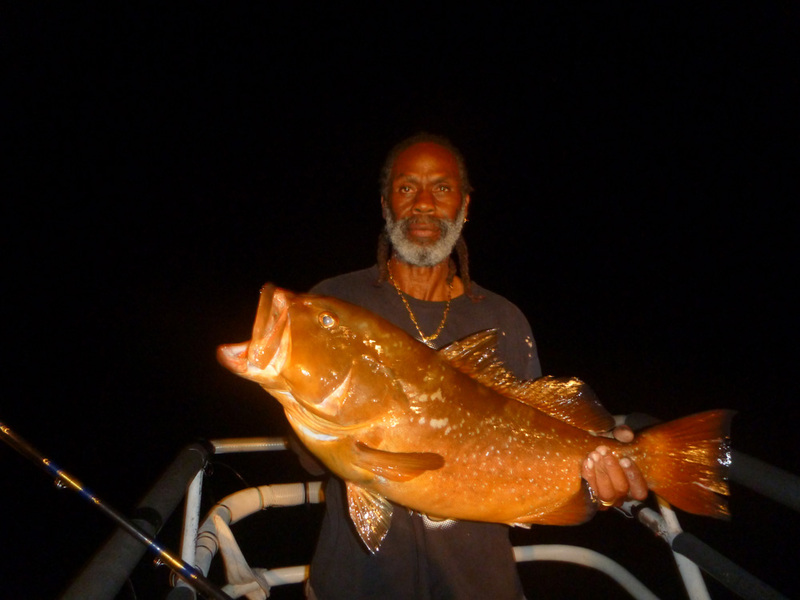 Yes, the queens started biting and the the yellow edge groupers did as well! Jay with a supper double. 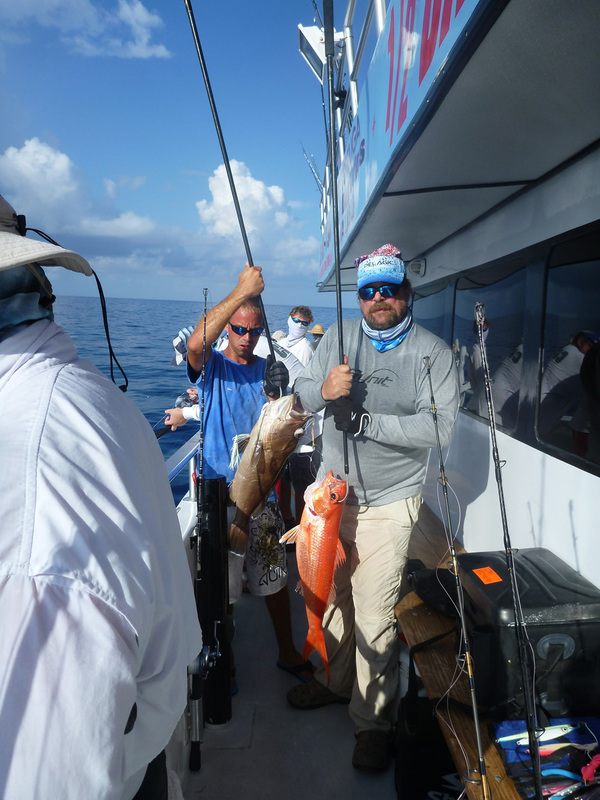 A yellow edge grouper and a queen snapper on the Dennis Cluster Phuck Rig. 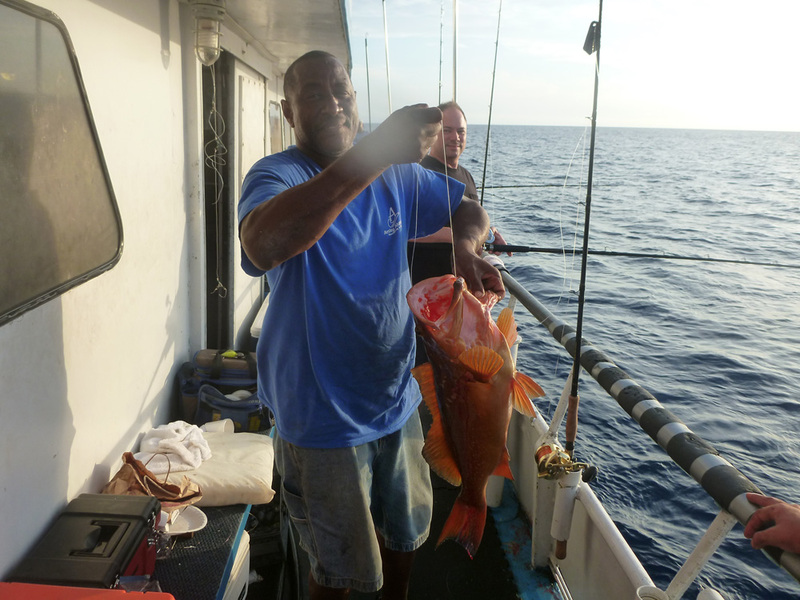 Gilbert with a super nice Queen Snapper. 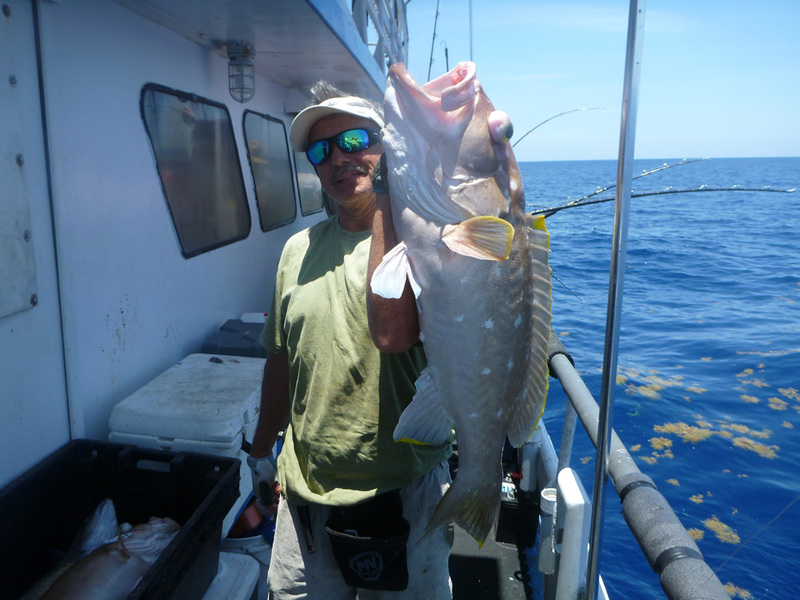 Me with a queen and Garriga with a yellow edge grouper. Jay and what I think was the heaviest fish of the trip. 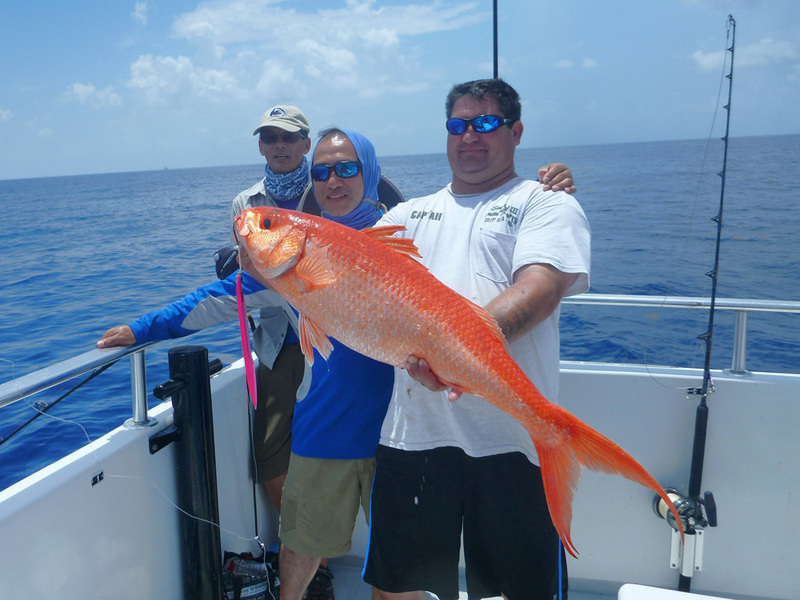 Chichi landed a hell of a Queen Snapper. That bite lasted until about 1:30 pm. Then it was move and move until the captain decided to go to the wrecks just outside Pulley Ridge. 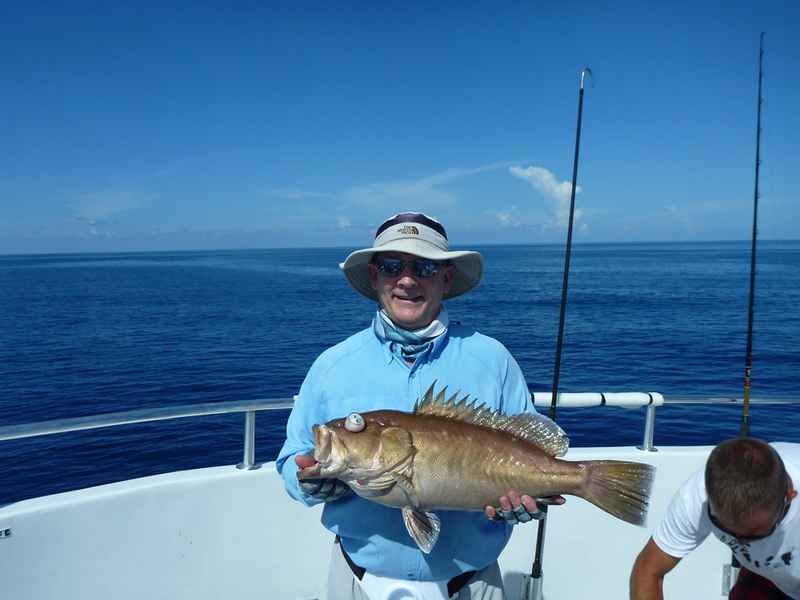 This is where Dennis landed a nice red grouper on a jig. Picture below. Then it was AJ and Almaco madness as everyone got hooked up and as many almacos were gaffed some AJ’s were sent back into the water with injuries. Some were attacked by the barracudas as if attached by piranhas. Below is Chichi and crew hooked up. Below is Bill hooked up. Below is Garriga and his AJ that was released. 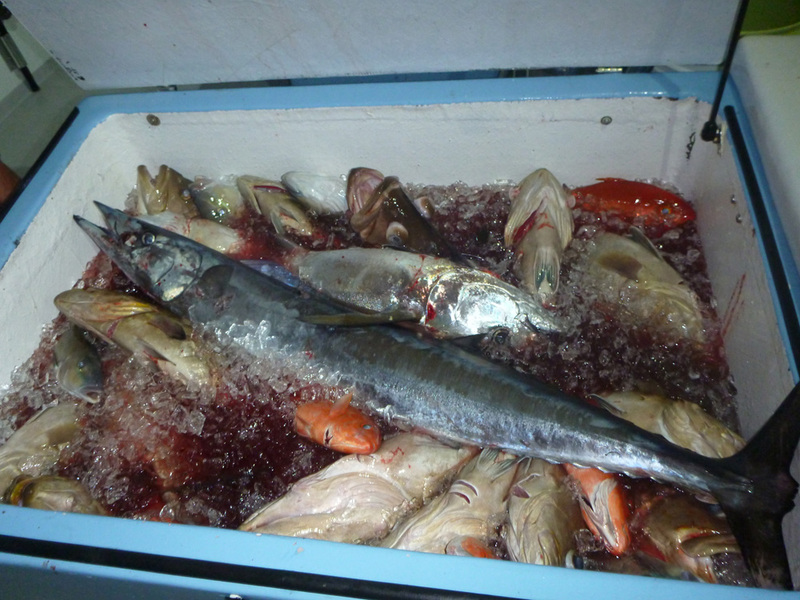 That was to be be the last few fish that jumped into the coolers. By now we were satisfied customers as we found some quality fish in the slow picking of the days of fishing. Then again it is called fishing not catching. 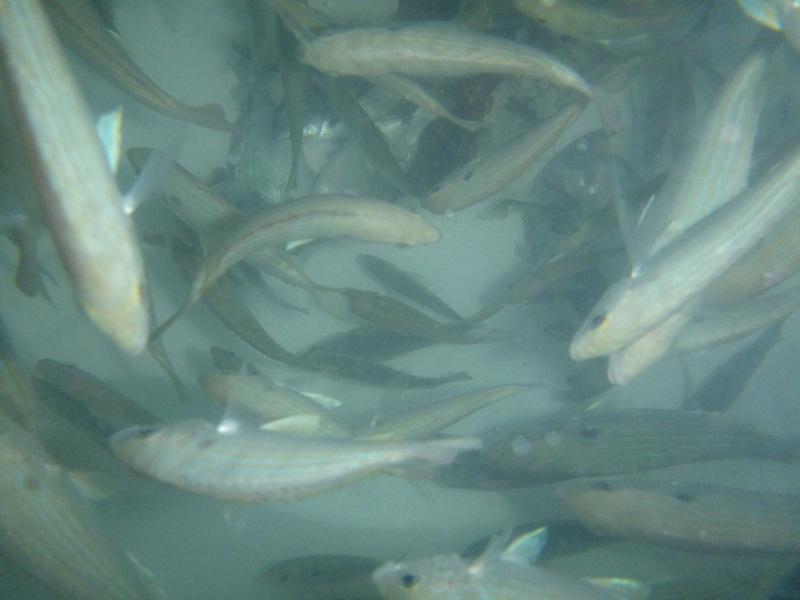 I checked the live wells and saw just as many pinfish made the journey back with us. All the rods were packed away on the top deck and off to bed we all went. The next morning we woke up to eat breakfast and pack our items to get ready to dock. The group Picture and our catch. 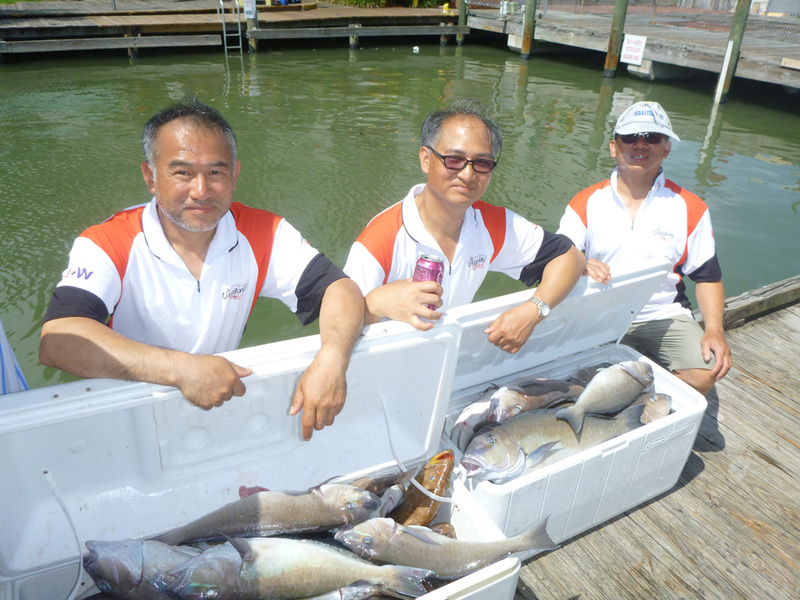 Chichi and his group with their catch. All in all the trip had an extremely slow start but gradually got better and better. 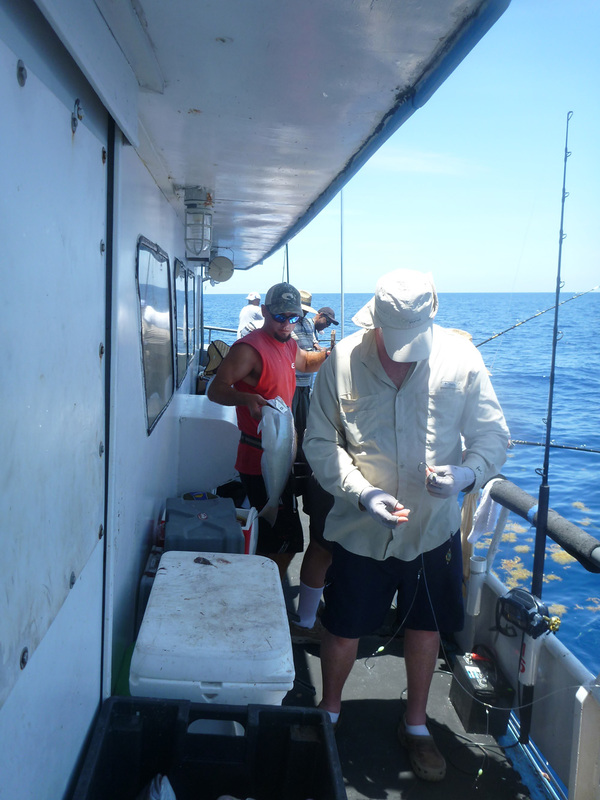 The Captain was great as always and the crew worked very hard to get all the fish and tangles as fast as they could in that extreme heat. A special thanks to the Co-Captain Dennis who was also our chef cooking all the meals. He catered to everyone’s needs for the food. This trip was basically an exploration trip for the Out Of Control IV group. They have now found the fish so their next trip should start with a strong bite. A big thanks to the http://www.JiggingWorld.com crew for sponsoring the trip with their donations. Update: This boat is no longer on the West Coast of Florida. I was renamed to Super Sealegs and now operates from the East Coast. Yankee Capts Pulley Ridge Adventure- Deep Drop May 2014- JIG AND CRANK! It had to happen, I was able to get on a Yankee Capts Pulley Ridge trip. I went in with the hopes on getting some fish on 300 gram to 400 gram vertical jigs and some by hand cranking my Accurate 600 4:1 reel on a Calstar 850H rod using 2 pounds of weight. I was not expecting to compete against people using electric reels and I sure wasn’t expecting to fill a 150 quart cooler with fish and have enough fish to give away. More to that later. 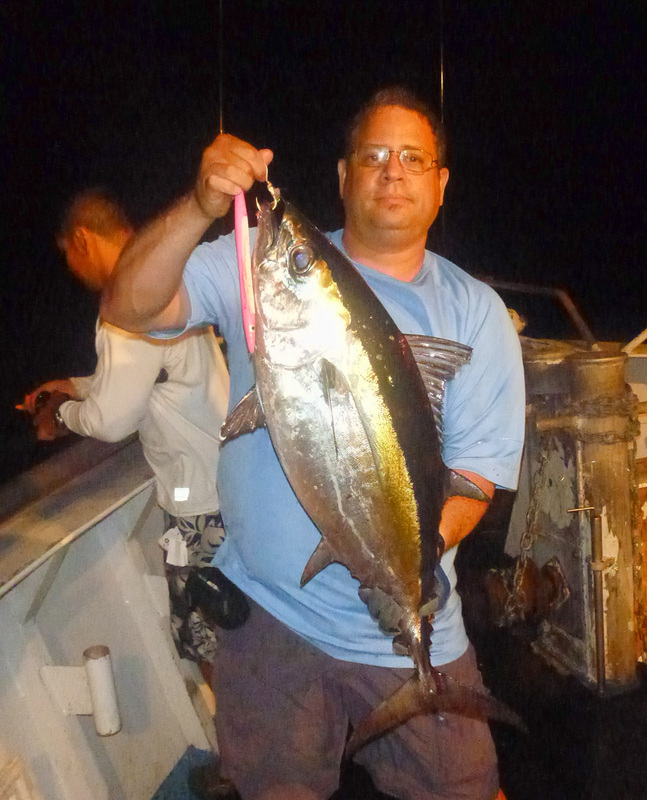 I have a jigging trip in July with http://www.360tuna.com forum members and in the board there are a lot of questions on what weight of jigs were needed to get down to the bottom on these 300 to 600+ depths. What could work if jigging and how many tangles one would get if fishing next to people with electric reels. With this report I hope to answer many of those questions. So please just read along and be prepared for many pictures, so let’s get started. Below are pictures of the boat and the top deck as Captain Greg maneuvers to get out. 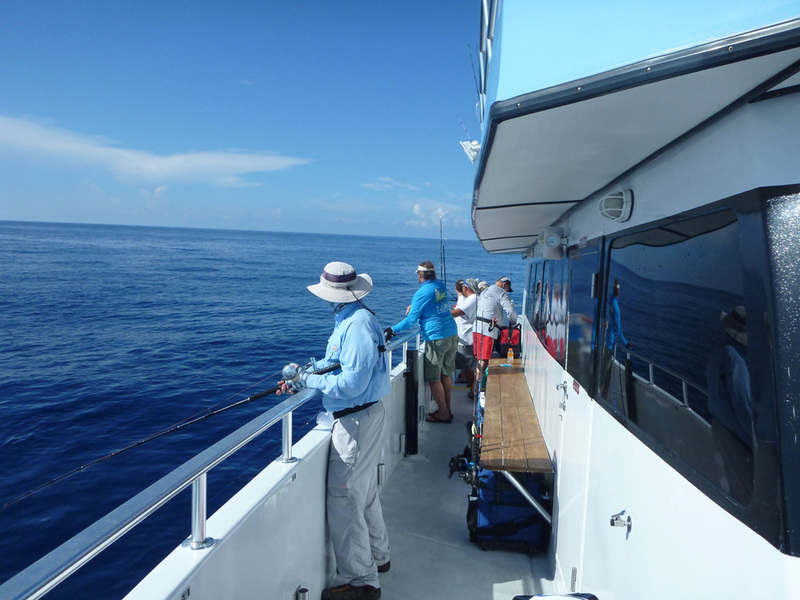 The top deck showing the rod holder and cooler space along a view to the transom and An setting up his trolling rod while he speaks with Leroy whom is one of the regular people that travel long distances to fish on the Yankee Capts. 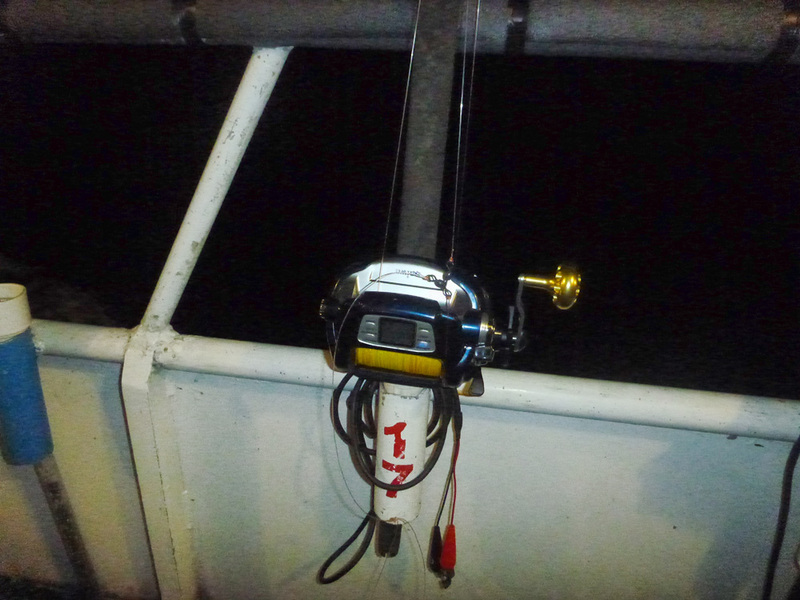 As the boat headed over to the fishing grounds I took notice of some electric reels and some home made and purchased gadgets. Below is a PVC pipe filled with concrete. It never saw the water. As the trip moved along An got a hit on his trolling rod, but unfortunately the fish was lost, but hope was still on the horizon as later on he landed a fish. I will continue the report a little different this time. I will do it as I try to answer some questions by people wanting to jig on these trips. What line and jig size? I started by using a custom Phoenix Titan rod, a Stella 8000PG with a custom 1600 spool that held roughly about 490 yards of 50lb test Tuffline XP line. It was plenty to get down to about 600 + feet. 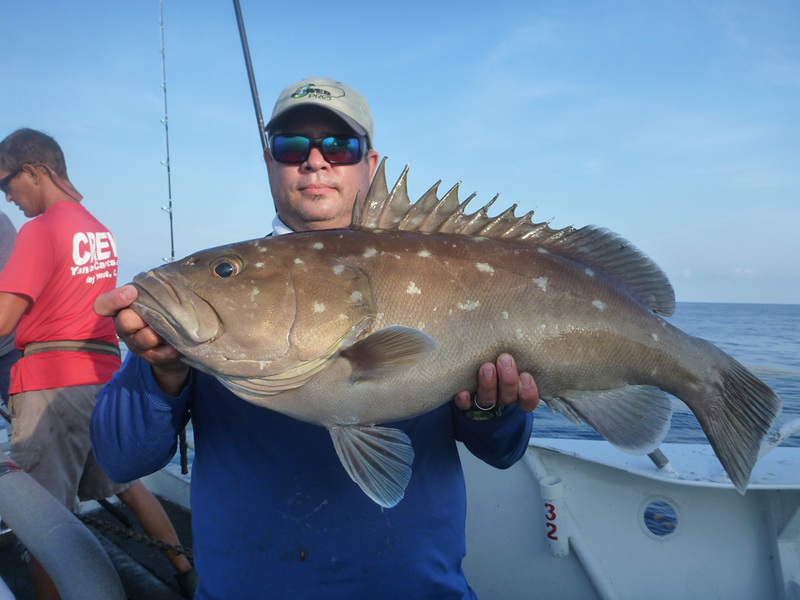 I used a 350 gram H4L Jiao-Long jig and as soon as I felt the bottom and first two pumps I was on a small yellow edge grouper. What is the max rod size, jig size, line size I need? I continued by switching to a 400 gram rod because I noticed I was getting lots of bites on the Phoenix rod but the bend on the pumps was too much and would not allow me to set the hook properly so I would loose the fish. I had not had that problem using a 300 gram OTI or a 300 gram Spinal rod setup in less than 300 feet, but I guess that this time the depth made a difference on the Phoenix rod. I have used the Phoenix with 300 gram lures and have not had problems in less than 300 feet of water. I guess the sweet spot on that rod is no more than 300 grams. 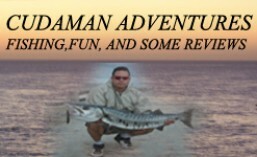 On the 400 gram rod I used a Jigging Master Ocean Devil PE6 reel that held roughly 500 yards of 65 lb Tuffline XP. I got the reel because it was within my means in cash price and it held a good amount of line. The reel has a little play on the handle but other than that I have been able to put the wood on the fish. As we got deeper I also used a 400 gram jig. Below is a small yet greedy scamp I got on a 400 gram jig on the way up after several attempts on hooking the biting fish. As you can see the jig is almost as big as the fish it self. 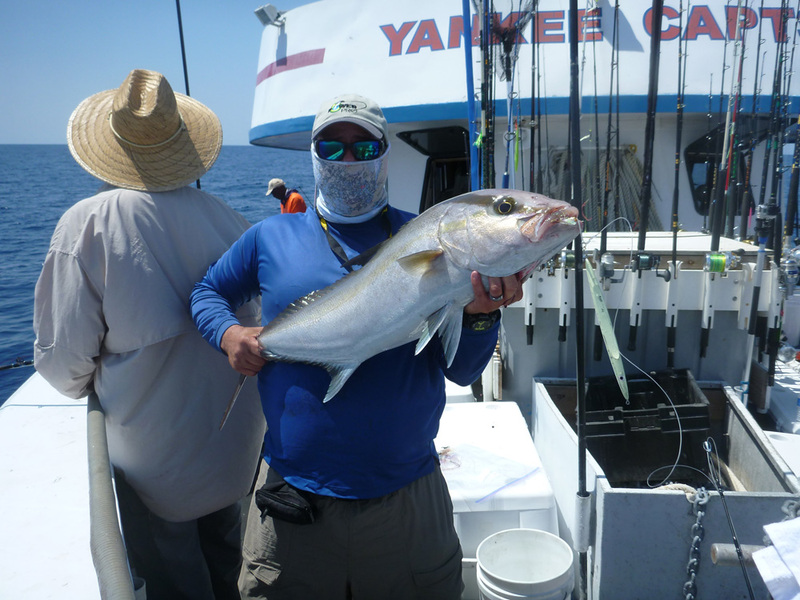 The Amberjack below hit on the bottom in 500 feet deep water. I was not expecting that at all. There were less than five caught. As the day continued and as we went deeper I switched to a 750 gram lucanos style jig with no results on a bare jig or tipped. By the way a 400 to 500 gram jig of similar kind would have done the job. I switched back and forth but my jigging rhythm was already off and I kept getting cramps as I do not normally drink enough water on a daily basis and did not ensure I had done so the day before. I decided to switch to hand cranking dead baits at around 1 pm. I thought perhaps I could actually rest my arms that way and would drink plenty fluids while I did so. Here is a look at some non jigging dead bait catches. Below a happy fisherman with a Blue Line Tile. 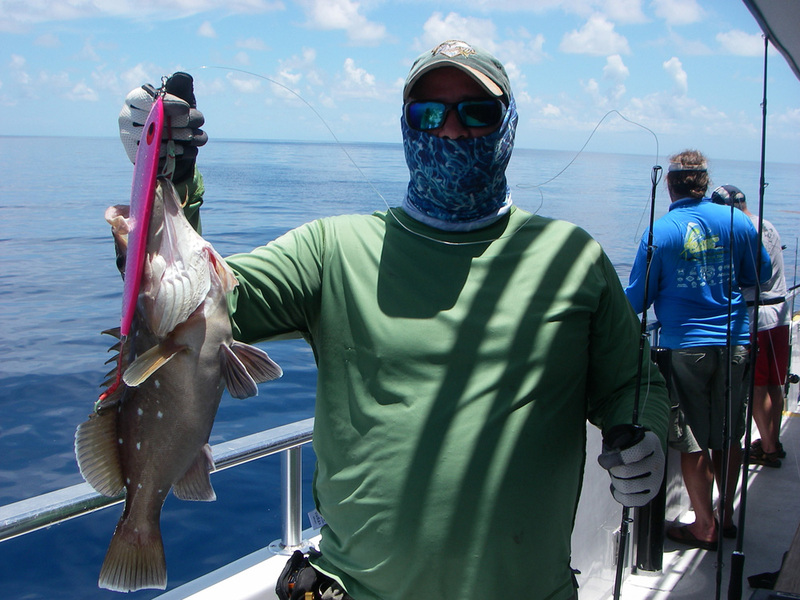 An with a nice Yellow Edge Grouper. 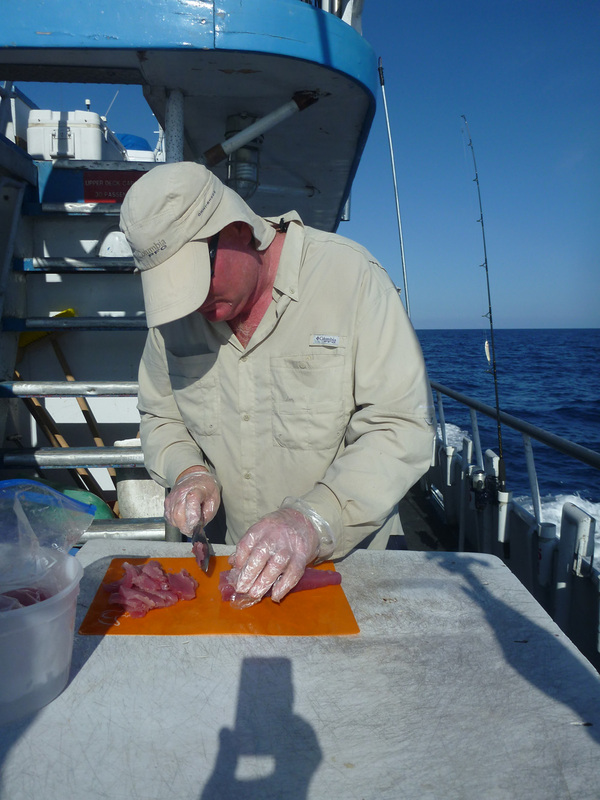 Me with a Snowy Grouper caught with squid while hand cranking. As the day went on Joe used a Gold Hammered jig and the assist hook with a squid skirt. He got a Blue Line Tile on it. So yes, the diamond jigs do work. 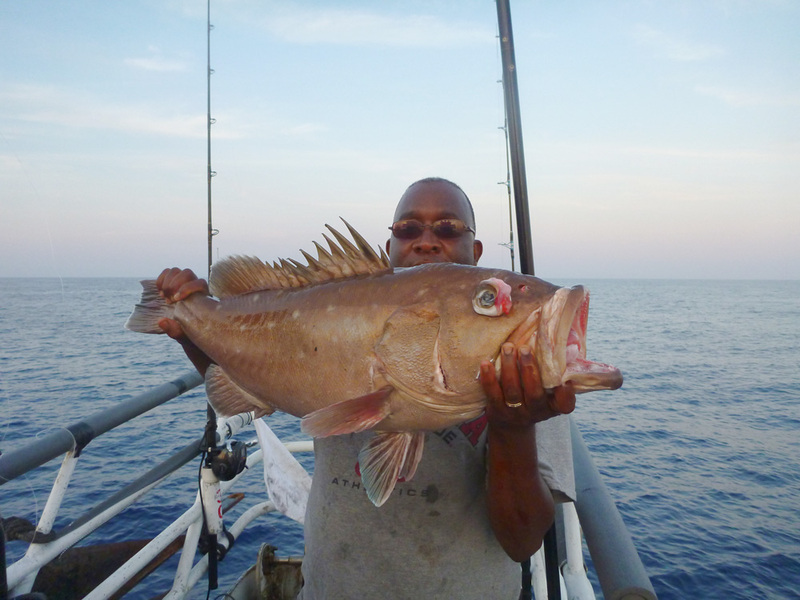 As the sun was falling down another happy fisherman by the name of Lonnie Blue Thang Man, a little pun intended on the blue line tiles he got 🙂 landed a nice size snowy grouper. After Joe got his Blue Line Tile, it occurred to me that maybe the glow lures would work better at sunset so I rapidly started jigging again and used a Salt Water Assassin sea shad which helped me land a nice size Blue Line Tile. How many tangles could there be if I fished next to people with electric reels? 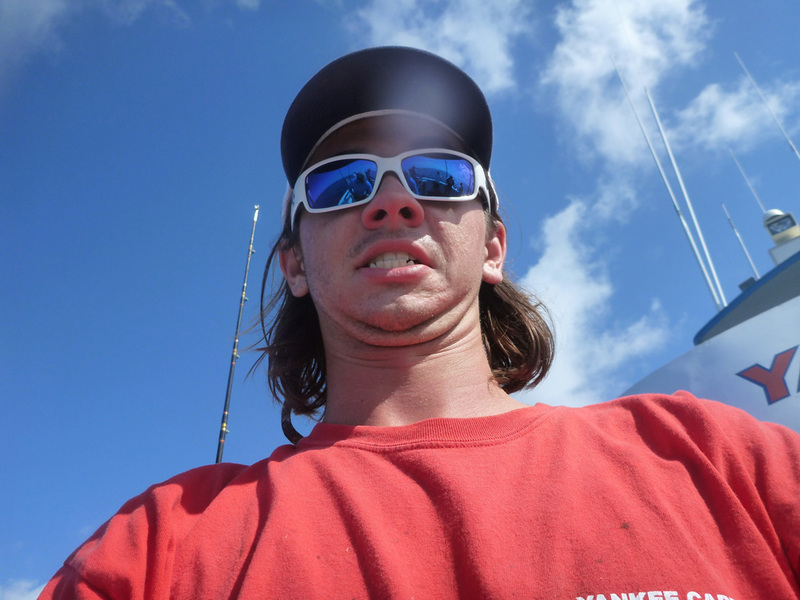 while vertical jigging I had 6 tangles during the entire trip. I was able to maneuver in between all the lines. Now, the electric guys them selves is another story as they bring 2 to 3 fish at once and these are spinning all the way up, so they did have more tangles. Even while hand crancking I only had a few tangles. Will I loose many rigs to the bottom? I did not loose a single rig to the bottom but did loose one to the tangles. Night time came by, I was exhausted. I went upstairs drank as many sports drinks as I could and ate a couple of protein bars right before the dinner served at the galley which hit the right spot in my stomach. 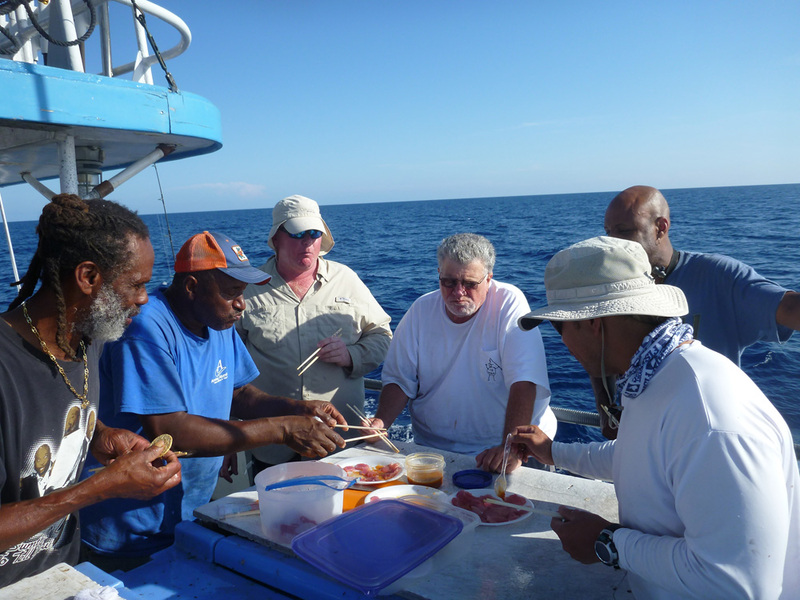 While dinner was served Captain Greg moved to boat to a shallow mound that held mutton and groupers. I took the opportunity to take a nice nap and recuperate a bit. 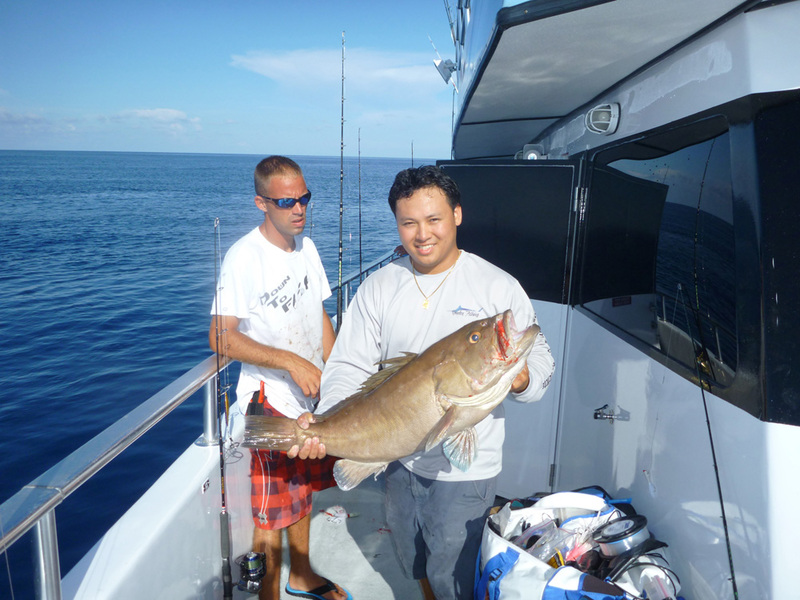 As we started fishing we set our 8 to 10 ounce weights Cesar got a nice red grouper and so I started fishing for them as well. 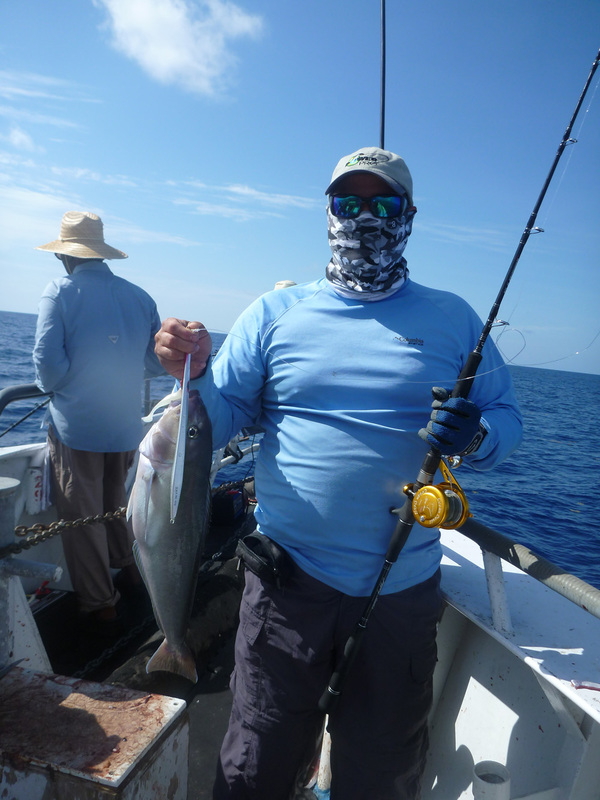 An used a nicely cut piece of speedo and landed a nice mutton snapper.I knew I had a light weight snapper rod but the bottom as explained to me had very few rocks and holes for the grouper to hide so my 30 lb test line and 40 lb leader would do just fine. 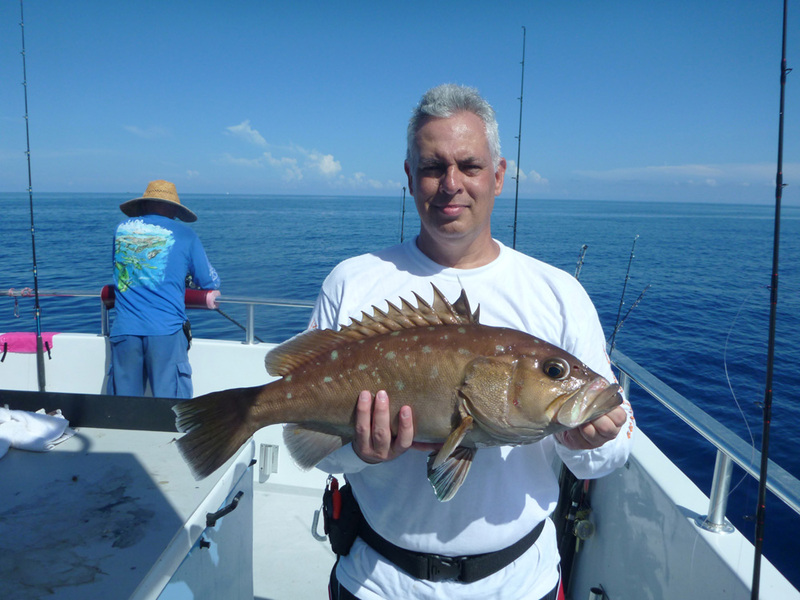 I used a speedo head just like Cesar did and also landed another red grouper. Cesar and his red fire truck. 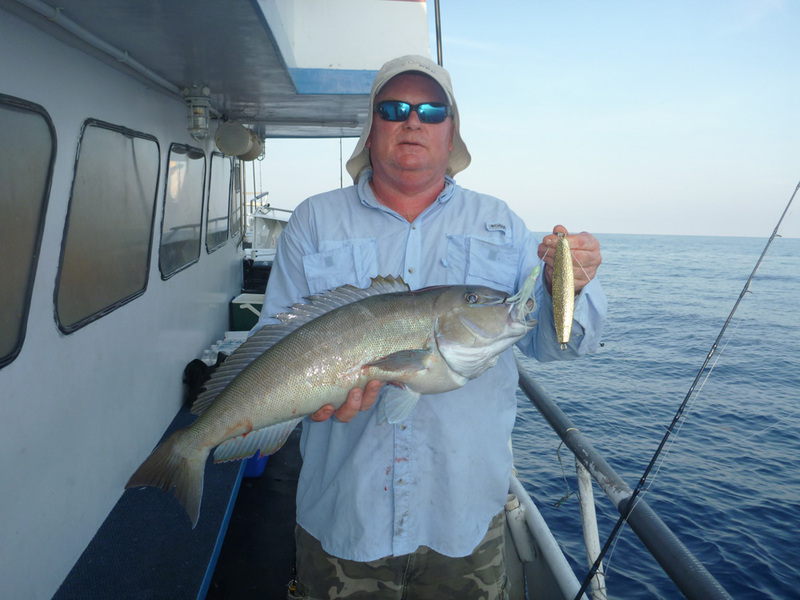 An and one of his mutton snappers. Me with my red fire truck. The bite slowed down and so did I, I took another power nap and hydrated my self again and again until I was feeling better. Then the sound I wanted to hear was heard. Blackfin Tuna! I know many of you don’t care about them but here in Florida is hard for us to get them past 5 to ten pounds so I hurried and started jigging and set my goal at ten but it was a bit slow so I lowered my goal to 5 and then at around 2 am and after not getting any more red groupers and with An landing about 3 or 4 muttons and Cesar doing the same I started to get my rhythm back and so I got to my goal and said I would get one more and as I got one more people started asking for some tuna for bait or for their coolers and the tunas started growing from 5 pounds to decent 20 pounders. In the end I ended tired at 10 or eleven blackfin tunas of which I gave away 6 of them. A few more people got some nicer ones on bait and some decent ones on jigs. All in all I would have landed more but had the smaller 250 gram spinal rod set up with 30 lb braid and 50 lb mono (momoi line) I had forgotten I tested this line with the PR knot and forgot to take it off, the line slipped away. I will never do that again. I then switched to a 50 lb leader that I had never used and perhaps was a few years old. The knot was on there but it would brake on the part that held the solid ring, at first I thought I was getting cut off but the after a few tries I decided to test the knot and POP! every time I pulled on it by hand it broke. I switched the leader to 80 lb mono and had no problems after that. The night was ending and was almost 4 am so I asked An for a favor, I asked him to wake me up when the sun came up and so he did and I thank him for that. 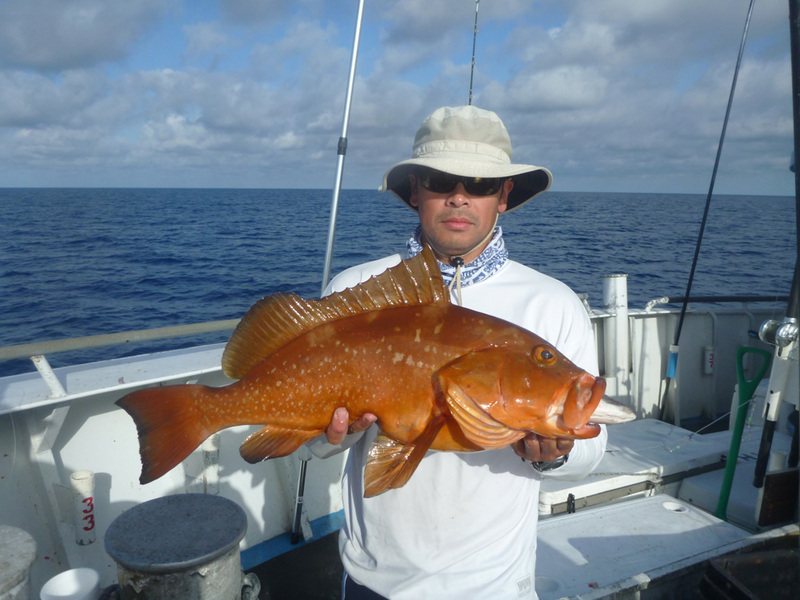 First up was a gentleman and his first red grouper ever, then An and his red grouper. I started jigging again and got another Blue Line Tile. Jake snicking a selfie while taking my pic. 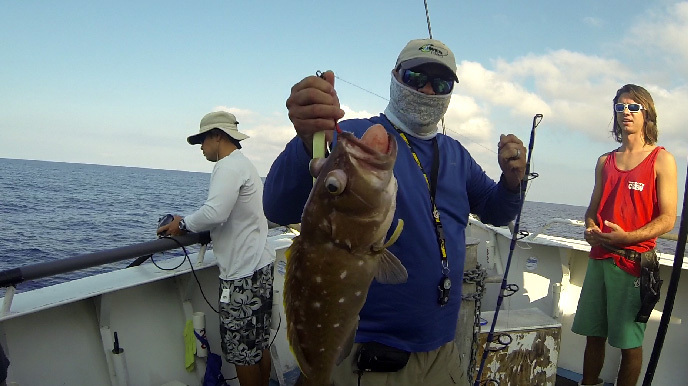 Things started looking better and more and more groupers were hitting the decks. People woke up and filled the rails once again. 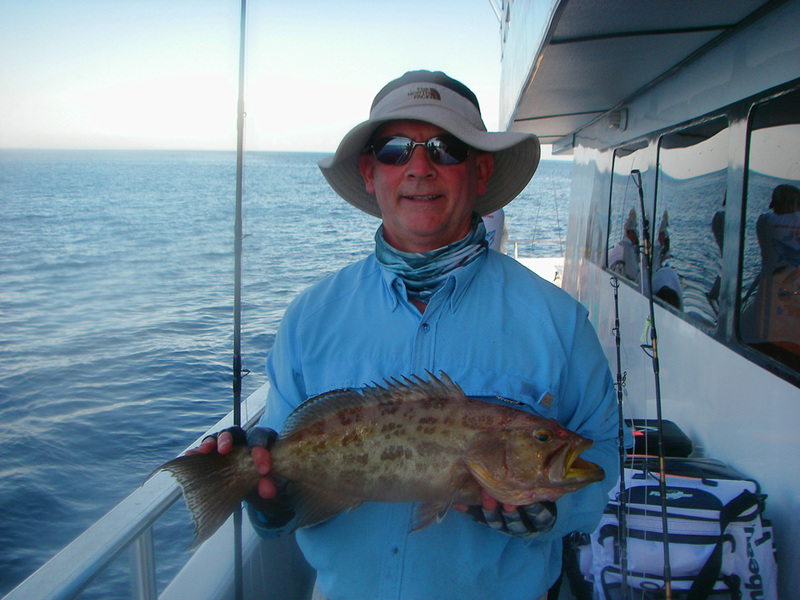 Here is a nice 24 lb Yellow Edge Grouper and the happy fisherman that caught it. The tote before the 24 lb grouper. The tote after the 24 lb grouper. Here is a look at all people fishing towards the stern. Here is a look at all the people fishing towards the bow. As the day went by more and more fish came in, I had been jigging and hand cranking bait along with 4 others and with weed lines all over the place I kept my eyes opened for more dolphin fish (Mahi Mahi) and all of a sudden something that had not happened during the trio did happen a shark showed up and ate Cesar’s fish that he was battleling for quite a while and then Jake screamed dolphin! 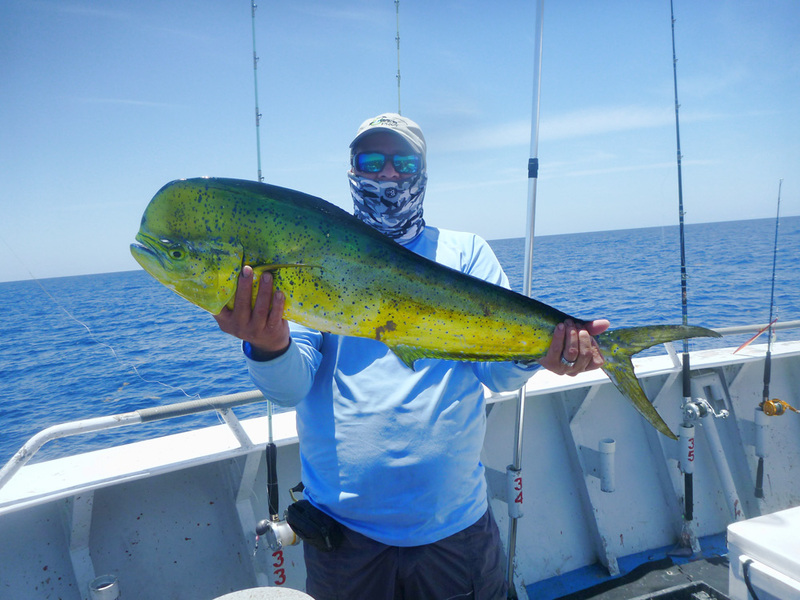 (Mahi Mahi the fish). I quickly got my rod and tossed a bonita strip the fish took it and and was landed, but that was the only to see for the rest of the day. 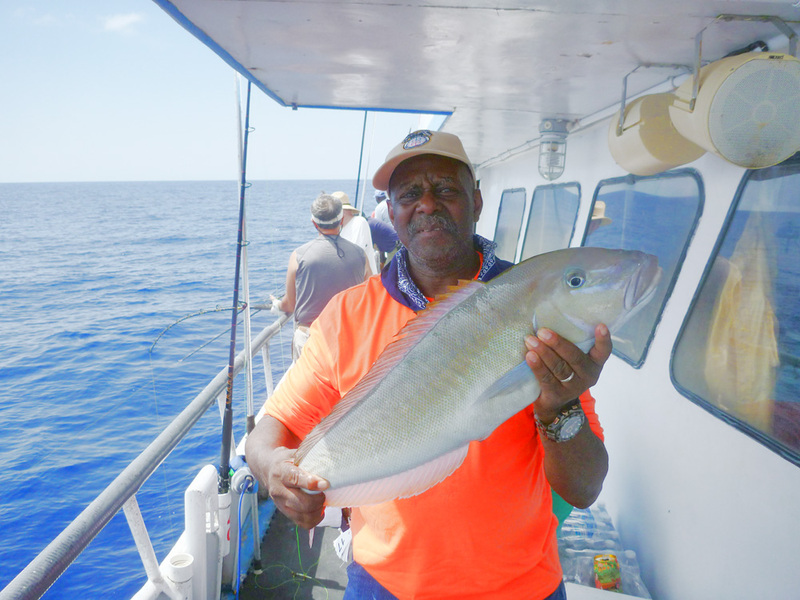 More and more fish came on board via the electric reels and the coolers were almost to the rim so Captain Greg gave the announcement that we would leave around 5 pm to be back home at 6 am. By this time we were 150 miles from Key West and it would take 12 to 13 hours to get back to the dock. And so the boat was on the way and Joe kindly prepared awesome sashimi with home made sause. This was delicious, he needs to let me know where he wrote the recipe so I can try it again. Joe preparing the Sashimi. Adding the awesome sauce. Many others joined and got a session on using chop sticks. Then, as I was taking a shower I hear a lot of screaming. CRANK! CRANK! UPSTAIRS! DOWNSTAIRS! WAHOOOOOO! An’s rod got hit and they landed a wahoo. I ran to get the camera and took a snap shop. 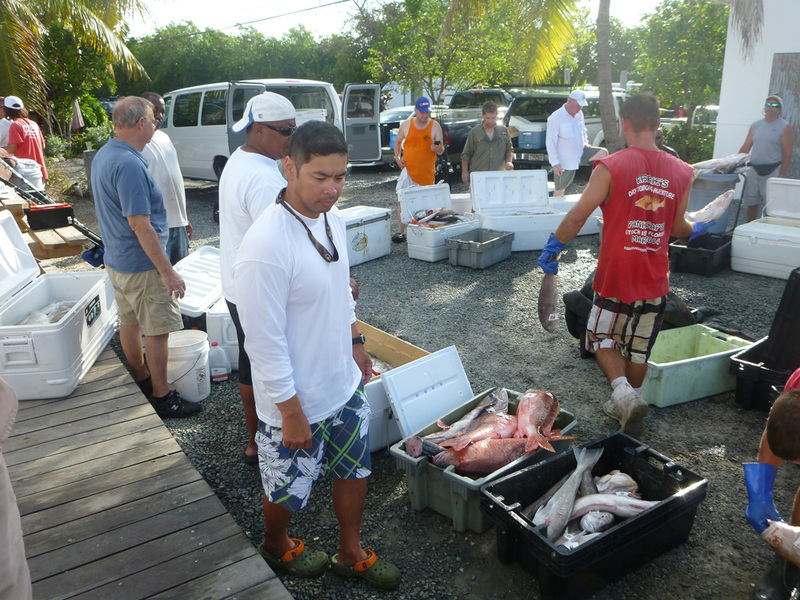 After that event it was the next morning and the totes started to line up the deck with the catch. Below is a pic with only part of the catch. As we got back to the docks it was business as usual. 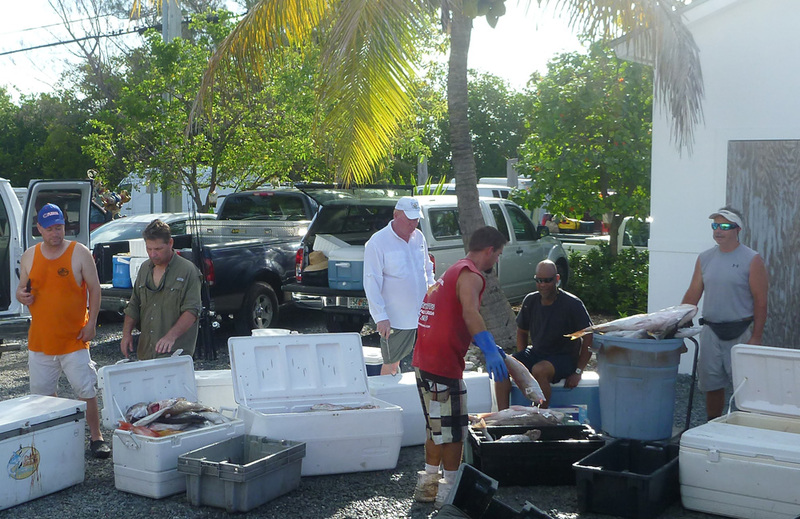 Everyone gathered around the totes and the fish was passed along to the people holding their numbers. 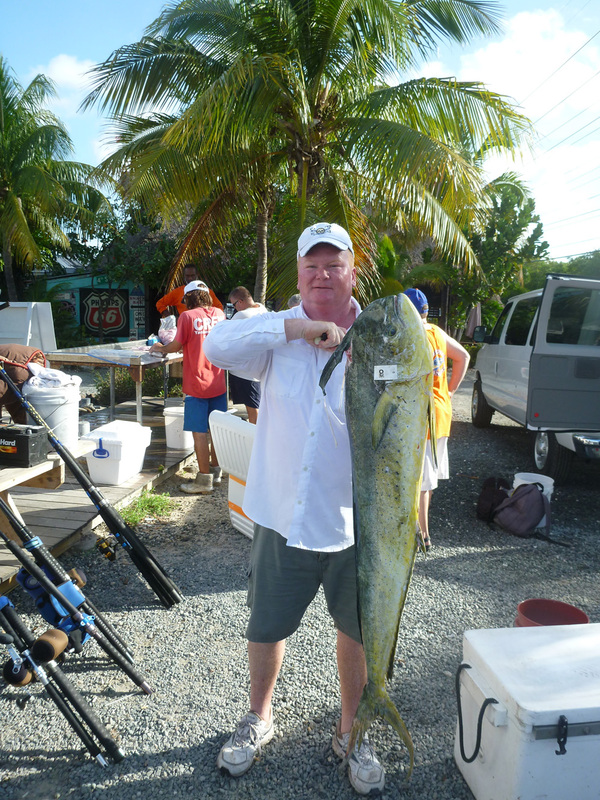 Below is Joe and his pool winning fish. 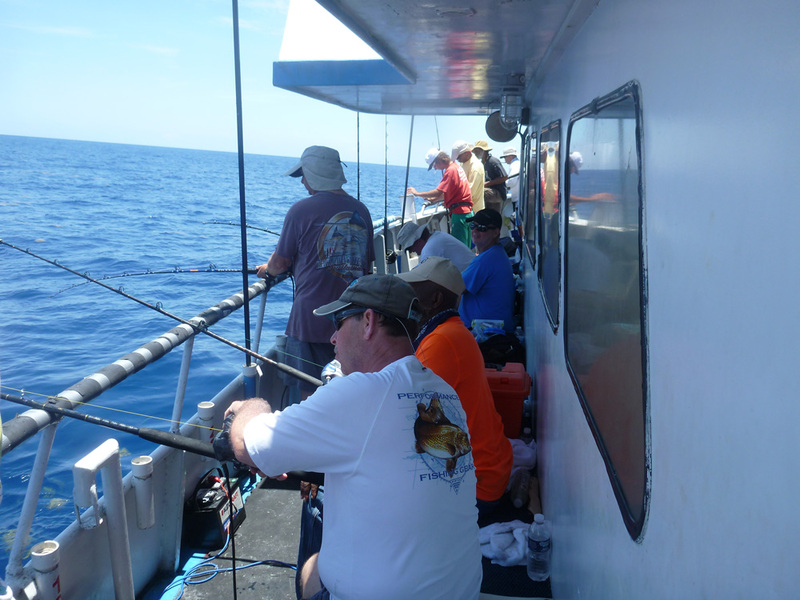 Here are the 360Tuna members that came on this trip. 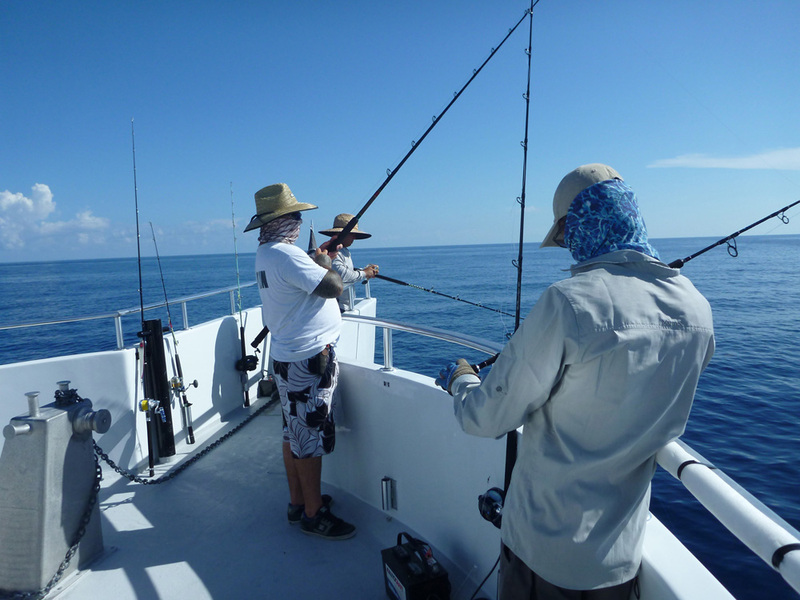 Here is the end summary of my fishing report: THE FISHING TRIP: Pulley Ridge day Fishing Trip Aboard the “Yankee Capts” with Captain Greg The Spot : Around 150 miles off Key West, FL Weather Forecast: Sunny 0% chance of rain, Saturday winds 5 to 10 knots then up to 15 knots. Seas 2 to 4 feet. 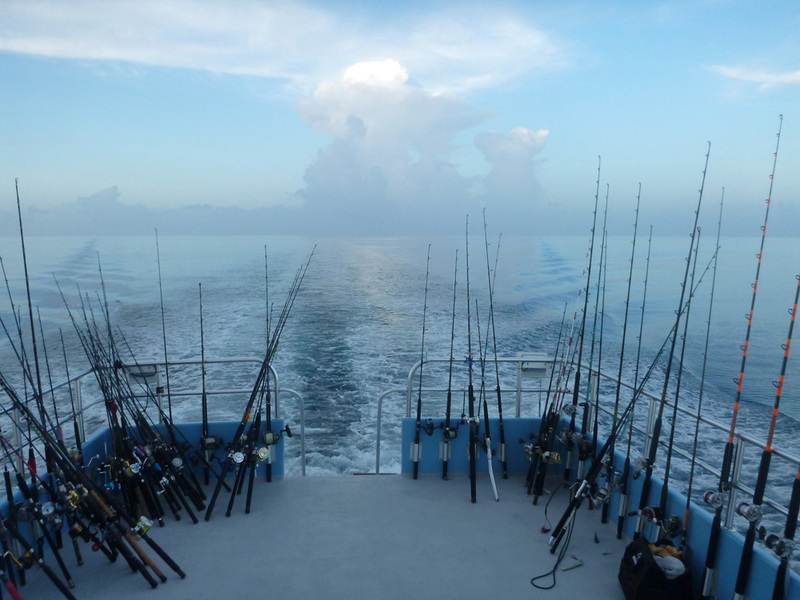 The real weather was: Earlier seas 1 to 3 feet and maybe 2 to 3 by Sunday?, clear skies every day. Water: For the most part it was calm in the morning then a bit choppy and mild current later in the afternoon. Current: .5 knots to 1 knot. 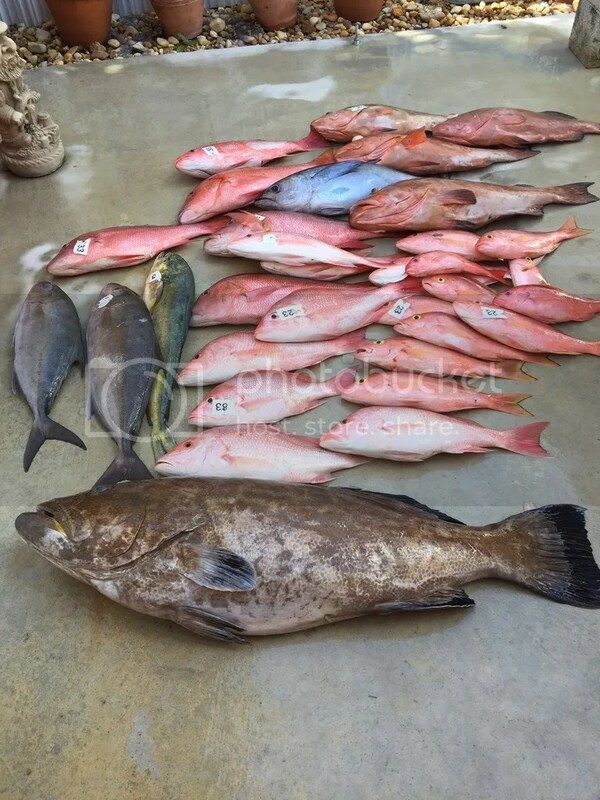 Fish catches: Yellow Edge Grouper, Snowy Grouper, Red Grouper, Blue Line Tiles, Blackfin Tunas, Mutton Snappers, Amberjacks, Yellow Eye Snappers, Blackfin Snappers, Mahi Mahi, etc. etc.etc… Biggest size Type : Mahi Mahi 28 Pounds, Snowy Grouper, about 30 pounds, Yellow edge grouper about 24 pounds Techniques : Me :Vertical Jigging. 3 others: Hand cranking using dead bait. The rest: Dead bait and electric reels. Jigs I used: 300 grams all glow colors and 400 grams to 500 grams holographic jigs with assist and squid skirt were working. A question was asked on what gear I took so I am adding it here as well. 400 gram JM Terminator II jigging rod with JM OD PE6 and 65lb braid 300 gram Pheonix Titan jigging rod with Stella 8000PG and 50 lb braid 250 gram Spinal jigging rod with Saragossa 10K and 30 lb braid Calstar 850H 8.5 bottom rod with Accurate 600 4:1 low gear single speed. Fished 2 pound lead on it and 850 gram lucanus style jig. 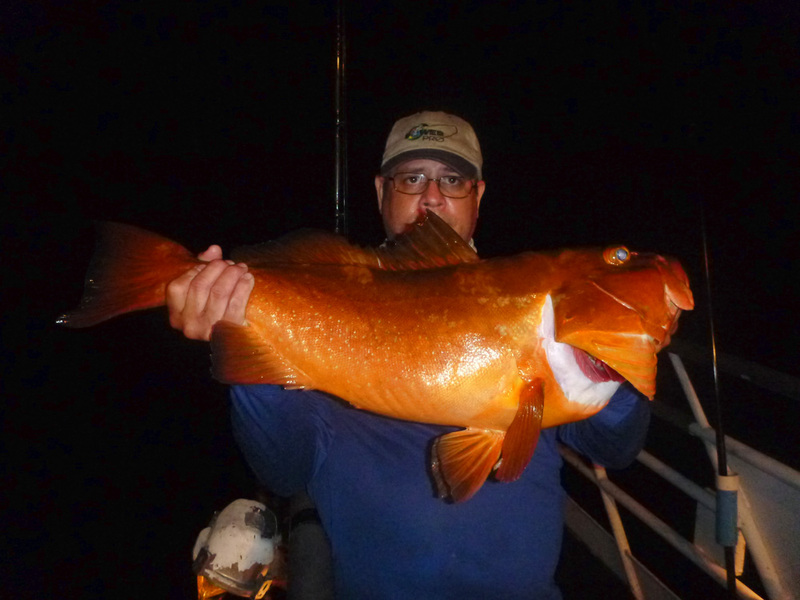 Calstar 800L 8.0 bottom rod… fished at night for red grouper / snapper One 7 foot Jaws jigging rod that I used for dolphin with a Diawa Saltist 4500 and 50lb braid. Ii believe the total on my jigs went: One jig bag 6 300 gram jigs 3 350 gram jigs 6 400 gram jigs 2 500 gram jigs many 100 to 250 gram jigs for night time. 2 400 gram lucanos style jigs 2 750 gram lucanos style jigs 2 two pound leads — If you are only fishing bait then you might need 4 two pound weights and 4 three pound weights and 2 four pound leads (per http://www.yankeecapts.com site). several 6 ounce weights but did need 8 to 10 ounce weights. 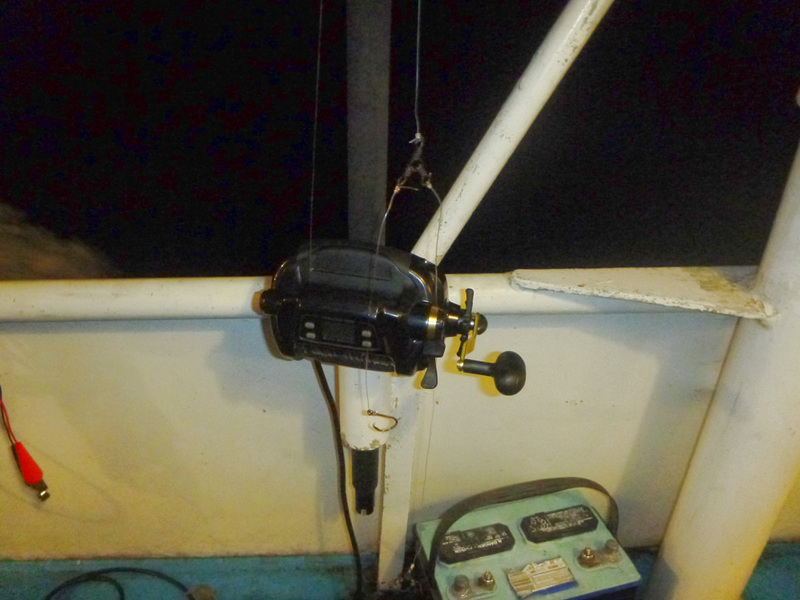 <– for snapper/grouper fishing at night 6/0 wide gap circle hooks—25of them 8/0 wide gap circle hooks–25 of them l00 lb leader 2 spools— used 1 spool 80 lb leader 2 spools— did not touch it my assit hook Shout Hako 4/0 Shout 5/0, 4/0, 3/0 Fisherman 6/0 All on kevlar or Owner with wire inside. sleeping bag 4 shirts 2 pants 1 short 1 pair of crock 1 pair of comfy shoes 6 buffs 6 pairs of sock to keep dry feet 6 undies lol, gotto be comfy 2 pairs of gloves 150 quart cooler to keep ice 50 quart cooler for bait small snacks and food cooler For those asking me these questions: Where can I get information on the boat future trips: http://www.yankeecapts.com What is the cost? in the 2014 schedule $650 for a 3 day Pulley Ridge trip and $725 for a 4 day trip. Look at their site for updated pricing information. Does the boat have a galley? Yes and coffee for the whole trip is $8 and worth every penny. What does the food cost? Same prices as a fast food place or a diner $3 to about $10 Are there showers? off course there are Is bait included? 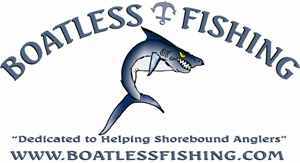 Yes the boat has bait included but it will be good if you bring a bit extra for your own. They had squid and ballyhoo when I went. More than enough to make the trip count. Can the boat provide rods? Yes they can. 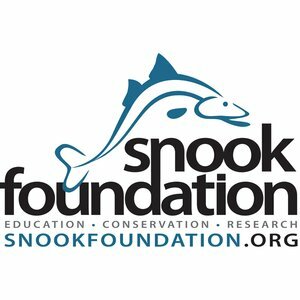 Can I fish without an electric reel? Yes you can I did it in this trip and so did other 3 people and we filled our coolers. What kind of reel should I use if hand cranking? As big a reel you can get and a low gear will help you get less tired while fighting the fish and while bringing that heavy weight. What kind of weights? Look at the Yankee Capts website tackle recommendations. I used a 2 pound weight for deep dropping and others used up to 3 pounds.